Invention for Destruction, now available on Blu-ray and DVD from the Second Run label, is a Czech film; yet this wondrous retro-fantasy, lovingly restored, should be of interest to any fan of Laputa, Steamboy, Nadia, Gankutsuou and Howl’s Moving Castle. Invention is a steampunk film, but it’s also deeply, magically surreal; it’s a fusion of live-action and animation that’s practically unique in the world. To get an idea of what it’s actually like, there’s no substitute for the trailer. 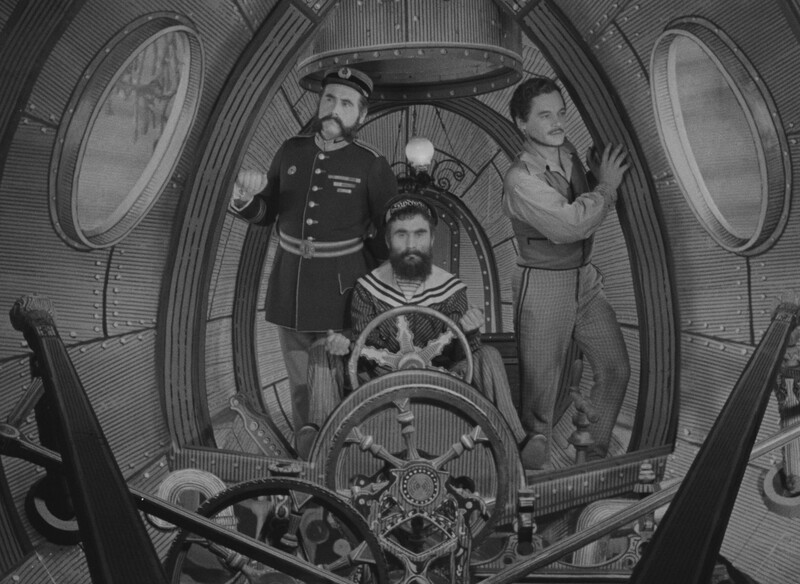 It’s adapted from Jules Verne’s classic tales, but it’s so much more than that. 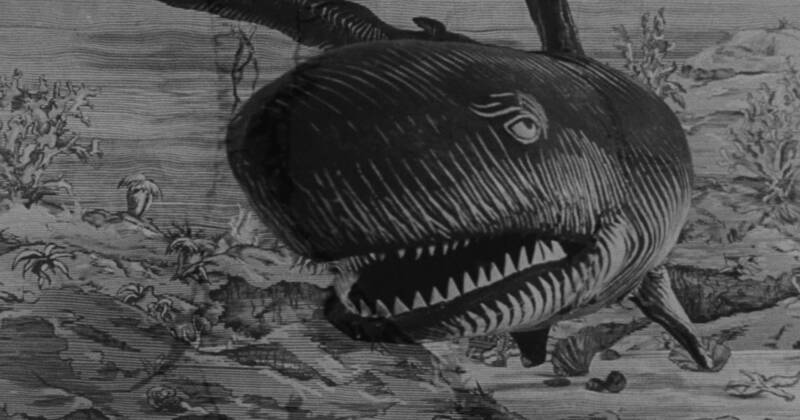 It also adapts the classic Verne illustrators, nineteenth-century artists like Leon Bennett and Edouad Riou, who visualized Verne’s stories in beautiful monochrome engravings. You can see samples here (Riou) and here (Bennett). 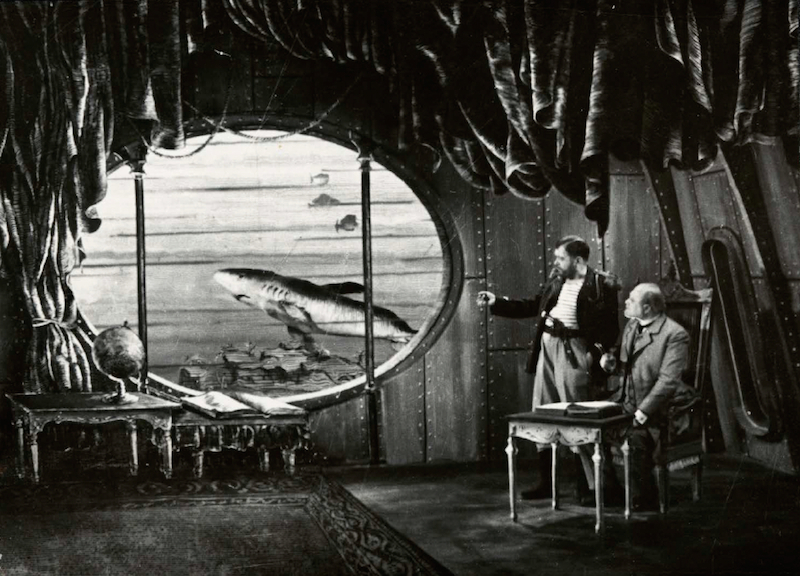 Karel Zeman, the director of Invention for Destruction, set out to bring those pictures to life through special effects where “live-action” and “animation” become equal parts of one thing. The story is simple; a villain aims to build an enormous supergun on a secret island with the help of a kidnapped scientist, while a plucky prisoner strives to foil him. The human actors are deliberately two-dimensional; they act with a rigid reserve that would have impressed Ozu, as Zeman marshals them through his hybrid tableau. There are some lovely jokes, like a wind-up pistol and divers riding pedalos underwater and ringing their handbells, but this is no zany comedy. The pictures are far more important than the gags. A couple of incidental sequences – for example, when the hero disposes of a pair of guards – drag on too long, but don’t mar the magic. It’s a boggling achievement, and enormously charming to anyone who loves handmade effects work. You could put Invention beside crafted, tactile kids’ shows like Bagpuss and The Clangers, or link it to the original 1933 King Kong, which also had an array of mix’n’match effects. Looking forward, Zeman’s work is often compared to the visions of Terry Gilliam, especially his Baron Munchausen (Zeman had made his own Munchausen back in 1961). Invention’s underwater scenes, including animated subs, sharks and squid, may remind you of Wes Anderson’s Life Aquatic and its heroes’ brush with a jaguar shark. Invention for Destruction has a Japanese connection mentioned in the new home edition, in an excellent 15-minute talk by British director John Stevenson, who co-directed Kung Fu Panda. He saw a clip from Zeman’s work on TV back in the 1960s. Young Stevenson was so fascinated that he ended up ringing the Czech Embassy to get Xeroxed articles on Zeman, in raw Czech! Some older British fans of anime may find this story familiar. After he saw a terrible bootleg copy of Invention, the film’s first “decent” release was in a “mindbogglingly expensive” Japanese box-set, which Stevenson promptly bought. Older British anime fans may find that experience familiar too. The film’s main resonance for anime, though, is in its embrace of steampunk, long before that label was coined. Invention is a fantasy that borrows all the nineteenth-century furniture and futurology of Jules Verne and his contemporaries, the steam engines and rockets and submarines, all that marvellous overbuilt mecha. So do many anime, including the titles I mentioned at the beginning. Perhaps the closest that an anime has got to Zeman is in the beautiful title sequence for Miyazaki’s Laputa, which evokes engravings down to the hatched lines. One: steampunk is as strong in anime as it’s ever been. Just look at the series Kabaneri of the Iron Fortress, where a massive steam train charges through zombie hordes in a version of samurai Japan. Or look at Princess Principal, in which intrepid girl spies operate in a divided nineteenth-century Britain, often flying with the help of anti-gravity Cavorite (invented by H.G. Wells). Both series are spawning cinema sequels in Japan this year. More current anime have strong overtones of steampunk, ranging from Attack on Titan to Violet Evergarden via Made in Abyss. Point two: steampunk will never catch on in Hollywood. Okay, so never say never, but after the winter blockbuster Mortal Engines, no-one’s likely to try another steampunk epic for a decade or more. Mortal Engines was written-produced by Peter Jackson and based on a wonderful book by Philip Reeve that could be a brilliant anime; the story turns London into a motorized Laputa that runs on wheels. Not only was the film a commercial disaster (I personally thought it was a good bad film); it was the latest in a whole string of failed efforts to make Hollywood steampunk. When one small sub-genre encompasses Wild Wild West, Treasure Planet, Golden Compass, League of Extraordinary Gentlemen and now Mortal Engines, you have a track-record that’s almost matchless in big-budget misery. NB: If you’re considering buying the new edition of Invention of Destruction, you may like to know the Blu-ray includes two complete short films by Zeman, made in stop-motion, that are not included on the DVD edition. Invention of Destruction is available on Blu-ray. Andrew Osmond is the author of 100 Animated Feature Films.